Ventless gas fireplaces are gaining in popularity for their ease and cleanliness. Plus, who can resist the allure of flames dancing in a nice, warm fireplace? Even though few homes today rely on fireplaces as their primary heating source, many homeowners still associate a fireplace with the safety and solidity of home. Installing a fireplace can often be a major problem due to venting, especially retroactive installation. The number of homes being built with traditional masonry chimneys for wood-burning fireplaces has plummeted in recent years. Even that alternative to the wood-burning fireplace, the vented gas fireplace, is being installed in fewer numbers due to the rise of air-tight homes, which save energy by closing off all possible thermal passages. With that in mind, a ventless gas fireplace may be just the solution. Easier to install than vented wood or gas fireplaces and capable of warming small rooms, gas fireplaces that have no vents passing to the exterior are becoming more popular for remodel work and even in new-construction homes. Alternatively called unvented, vent-free, or ventless, this type of indoor fireplace pipes natural gas or propane into a gas unit, with flames running through gaps in artificial ceramic fiber logs. Located in a fire-rated firebox, the gas unit has its own control panel with valves for controlling the pilot line and a piezoelectric striker button that lights the flame, much like the striker found on barbecue grills or water heaters. Holes and pins in the non-combustible artificial logs help them fit onto each other in a precise manner. Instead of venting through a chimney or tube to the outside, a ventless gas fireplace sends the spent gasses back into the room. Traveling in a U-shaped path, oxygen enters the bottom of the ventless gas fireplace from the room and vents back into the room through the top. 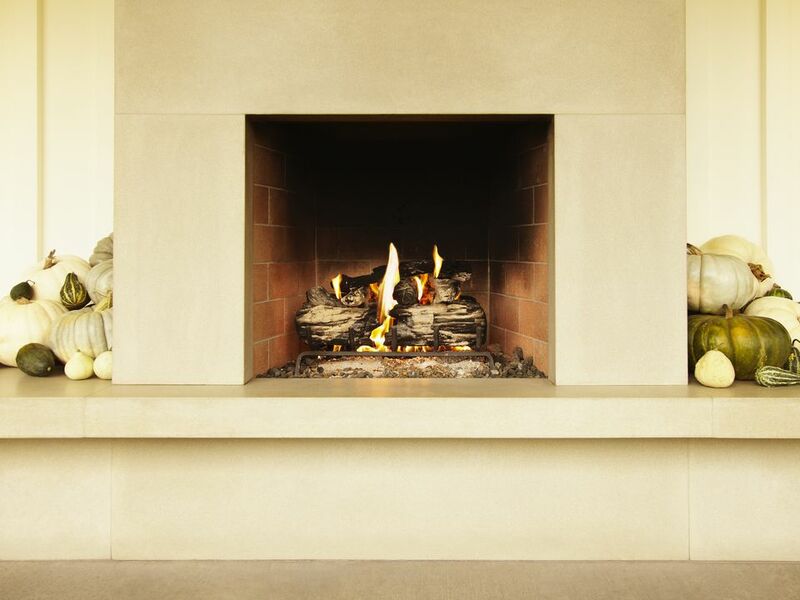 Ventless gas fireplaces differ from vented gas fireplaces in terms of the logs, flame patterning, and most notably, the method of venting. With vented fireplaces, the flames can run through, around, and over the logs, creating a more chaotic and realistic appearance. With ventless units, though, the flames must run through prescribed holes (called posts) that largely separate the flames from the logs. Combustion occurs whenever there is a flame, and spent gasses and debris from that combustion must vent somewhere. Ventless gas fireplaces are deemed to operate within the range of safety for cycling combusted gasses back into the home's interior. By contrast, vented gas fireplaces, which create a dangerously high amount of combustion, vent to the outside; its spent gasses are not returned to the home. Ventless gas fireplaces' safety is a subject of lively debate. According to industry group Vent-Free Gas Products Association (VGPA), a patchwork of regulations across the United States, from the city level up to the state level, controls the legality of vent-free fireplaces. Around 34-percent of states allow these units completely, with no restrictions at all. California is the only state that outright bans all manner of ventless fireplaces in every part of the state. In the remaining states, a welter of regulations controls ventless fireplaces based on factors such as areas of the house, population of the city, and altitudes. Venting any type of combustion is ideal. As forwarded by the ventless gas appliance industry, though, ventless gas fireplaces can be safely used because they burn a low enough quantity of gas that it will not present a hazard. As a backup, ventless gas fireplaces have a feature called an Oxygen Detection System, or ODS, that automatically turns off the unit if oxygen levels in the room fall below a certain level. This is especially a concern with the tight home movement: homes with better insulating value and more stop gaps that slow the exchange of indoor air with outdoor air. According to the VGPA, ventless fireplaces can be safely operated in tight homes because "an unvented gas heating appliance would be operating less during the usage period." This means that the amount of nitrogen dioxide in the room would be lower. Another safety device is the thermo-coupler for the pilot line. If the thermo-coupler cools down below a certain temperature, it will shut down the flow of gas. This allows you to keep the pilot light running all throughout the cold seasons. Ventless and vented gas fireplace inserts, gas units, and log assemblies are competitively priced with each other. Both require the same type of natural gas or propane line and stub-out, so there is no cost difference in terms of plumbing. The major price difference between the two types of fireplaces is with venting. Direct vent gas fireplaces require two vents in the back: one that expels gasses and another that draws in fresh air from the outside. The cheapest way to have a ventless fireplace in your home is with gel-based units. No plumbing is required, as the unit uses alcohol-based gel fuel canisters that burn up to three hours. Ventless fireplaces require no flues or chimneys. This saves wall and floor space. Plus, it limits the number of penetrations into the home, which is valuable for saving energy. Ventless gas fireplaces produce enough heat that they could conceivably serve as a secondary heat source for a small space. However, because indoor air quality is at stake, all ventless gas fireplaces max out at 40,000 BTUs. Unlike wood-burning fireplaces, ventless models produce no ash and no air-borne debris, making them a more eco-friendly option. Since some communities even ban wood-burning fireplaces outright, a ventless fireplace may be the only option. Vent-free models' flames look less real than direct vent gas or wood-burning fireplaces. Direct vent models tend to have a better flame pattern. Ventless models can emit odors since combustion stays in the room. While these fireplaces do create heat, there is very little radiant heat. The heat immediately leaves the firebox. The logs do not heat up much and thus do not retain heat.